Patrick entering the Waterpocket Fold near the start of the Burr Trail. Right: Geoff and David on our first day out from Torrey along 24 through Capitol Reef N.P. Slogging along the eastern edge of Capitol Reef National Park, I contemplate which is worse, terrific headwinds or continuous washboards. It’s a conundrum: the washboard probably would not be that bad if we were skipping over the small humps at a normal speed, but the high winds and blown sand are slowing us down so we feel every bump. Geoff, David, and I have done several tours and mountain bike trips together. We never plan suffering into our rides, but we don’t go out of our way to avoid it either. Typically, our route planning blissfully ignores topography, road conditions, and feasibility in favor of spontaneity and surprise. This route is no exception, sampling the park’s uncrowded riches plus parts of Grand Staircase/Escalante National Monument and Dixie National Forest. We ride loaded mountain bikes around and through these public lands, stopping regularly for canyon hikes. The 225-mile figure eight loop includes more than 17,000 feet of climbing, challenging dirt and road riding, and several spectacular side trips on foot. We are surrounded by colorful rocks and the effects of erosion, which together have formed slot canyons, pools, and massive cliffs. The visual and environmental contrasts throughout the ride include the scenery (and weather) of desert, forest, and sub-alpine settings. We are riding along the base of a continuous 75-mile-long steep drop in elevation, a geologic feature called the Waterpocket Fold. Early Utah settlers called this and other impassable features reefs. The reef is filled with towering sandstone domes, one of which is named Capitol Dome for its apparent resemblance to the U.S. Capitol building: thus, Capitol Reef National Park. On our first hiking detour up Pleasant Creek earlier today and before the wind, we see petroglyphs (engravings) from the early settlers as well as prehistoric Native Americans. A local who came out of nowhere early this morning recommended this hike, and it is well worth it with narrow canyons, bright flowers and plenty of water. We are headed toward the Burr Trail, an incredible, mostly paved road that connects Boulder, Utah, with Glen Canyon National Recreation Area. Back on the bikes, we cut the day short to get out of the stinging sand and share the 6-site primitive Cedar Mesa Campground with only one couple who, having bike-toured before and knowing how much we would appreciate cold drinks, kindly give us chilled wine drink boxes. The wind weakens the following day and subsides for most of the remainder of the ride. Eleven miles south of the campground, we improbably turn right toward the steep topography and the striking start of the Burr Trail. Adjusting our eyes to the reflection of the early morning sun on the multicolored sandstone wall, we can make out switchbacks crisscrossing the rock face. As we approach, the wall gains depth and we enter a canyon lined with inclined red and white sandstone beds that define the geologic fold we have been following. We also see a small arch or keyhole in the sandstone at the top of the ridge to the north. This place has no end of remarkable geologic formations. The overlapping histories on human and geologic time scales give us plenty to ponder as we continue our trek upward through the folded rock layers. 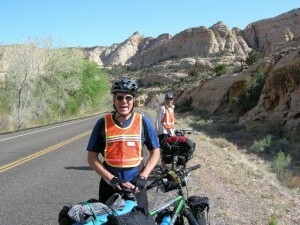 David riding along US 24 and out the east side of Capitol Reef N.P. with Navajo Sandstone domes in the background. The cliff-defying switchbacks turn out to be nicely graded and reasonably mild, offering great views of the Henry Mountains, which had received snow during the night. At the top, a short hike into a slot canyon provides water for filtering, and we continue onward, the road remaining dirt for only a few more miles. The National Monument portion of the road is paved; the wind now at our backs. These 30 paved miles should be on every cyclist’s tick list, especially the descent down Long Canyon. Here the twisting road drops 800 feet in 6 miles down a narrow canyon between 200-foot vertical red sandstone walls. 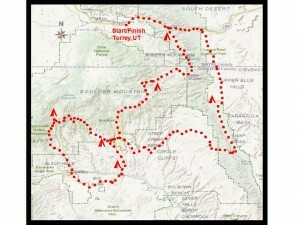 The 10 day route through Capitol Reef and the Escalante/Grand Staircase region. The walls get so close together that I start to feel like I could reach out and run my fingers down both sides. For the day cyclist, this would make a perfect out and back ride from Boulder, UT. I have never ridden anything like it, and we are almost tempted to turn around and do it again. But, more surprises await on the tantalizingly named Hell’s Backbone Road. We pass up the Deer Creek Campground near the Boulder end of the Burr Trail for “the cheeseburgers at the end of the tunnel” in town. The Burr Trail Grille does not disappoint. As always, we impress the wait staff by the end of the meal—“you want nachos?”—with our consumption abilities: soft pretzel with spicy mustard appetizer, Volcano Burger with blue cheese and hot sauce and a side of chips, a shared plate of nachos, and pie á la mode for dessert. YES! Before getting back to pedaling, we talk with some guys on adventure touring motorcycles. David and I have ridden motorcycles and tossed around the idea of riding through Central America to the Panama Canal. With each bicycle tour, this seems like a more remote possibility because I prefer long days on a bicycle. Our full bellies add challenge to our fatigue for the last few miles to our impromptu campground just after the unpaved Hell’s Backbone Road turnoff. The next morning a long, gradual climb up the 1930s Civilian Conservation Corps-built gravel road brings us to the rocky spine for which the road is named. On the way up we pass through piñon to mixed conifer to ponderosa forest zones. Two steep-walled canyons drop off to either side with a narrow bridge spanning the very top of the backbone or drainage divide. We enjoy the solitude and views of the rocky Box Death Hollow Wilderness before ending the day at the empty Blue Spruce Campground. Throughout the day I feel that ever changing vistas and the almost total lack of other tourists will make ride highlights hard to pin down; the whole trek is unbelievable to the point of surrealism. We decide to stay a second night to soak up the perfect temperatures, the flowing Pine Creek adjacent to the campground, and some great hiking options. After dallying in camp until noon, we amble down the Box Trail amid angular cliffs of Navajo sandstone, one of which had recently shed a boulder that knocked down a good size pine tree. The dirt road down to Escalante is fast, sinuous and fun but a little loose, especially in the tight corners. We stop to refuel ourselves at the Outfitters with Moroccan chicken salad on croissant and a pizza, and we run into the wine-drink-box couple again and learn that they are just heading back to Golden. Then we restock our food supplies at the Griffin General Store and continue on to the very crowded Calf Creek Campground. Despite ending up in overflow, we get lucky with a campsite next to the creek. David is always ready for a hike, and he goes to the big waterfall nearby, but Geoff and I pass it up for some quality time in the cool creek with a nip of whisky. I fall asleep soon after dark thinking about the next day’s lunch at Burr Trail Grille, conveniently the middle intersection of our figure 8 loop. We meet several friendly people the next day before heading out of camp, including a couple from the Netherlands who are afraid to take their rental car on dirt roads, another from Santa Fe, a mother who has taken her daughter here for a graduation present and two women from Flagstaff who are “looking for their men.” We duck, all of us being attached, and we head out for Boulder overlooking distant horizons from geologic features called the Hogback and New Home Bench along the way. After another excellent lunch, we start the big climb over an unnamed pass with great views of our previous traverse including the Burr Trail and the Circle Cliffs. Route 12 is really the only busy road we have been on, made slightly worse by riding it on the weekend. All of the drivers are friendly, especially the Harley-riding motorcyclists who honk and give us thumbs up all the way up the mountain. Only the rented RVs buzz us, and fortunately they are few. We stop and dip our heads in a stream before having lunch and then climb onward. We are passed by a speeding ambulance and then again on their slower return trip. Soon afterward the ambulance is followed by a tow truck with a crumpled Harley. I hope that rider is okay and remember to take it easy on our descent. An hour later we stop for another snack, the road continuously winding upward. We find out later that our climb today is over 4,000 feet, the largest single day on this tour. 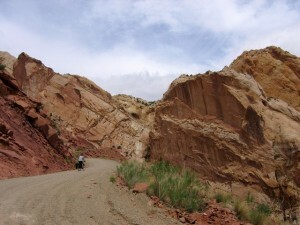 Before and during our ride, we have periodically discussed whether we would take Utah State Highway 12 all the way to Torrey or veer off and take the jeep road through the southern half of Capitol Reef Park. The traffic and our cumulative adventures on unknown dirt roads convince us to take the challenge. We ride down to the newly built and ATV-laden Lower Bowns Reservoir Campground, arriving late enough that the machines have all been turned off for the night. The jeep road into Capitol Reef from Lower Bowns starts out fun, but after five or six miles we find ourselves pushing fully loaded bikes through loose sand. Our lack of road quality research has finally caught up to us. The sun beats down, and we slip and strain, occasionally discussing turning back, not knowing if the sand will last for minutes or hours. After about a mile of this treatment the road becomes solid, and we are amply rewarded with spectacular and challenging rock and packed dirt jeep roads with small ledges and slickrock to help us forget the sand trap we have just endured. This part of the ride rivals even the Burr Trail for fun factor and scenery. I might even venture to say that I would brave the sand again to ride this offroad track. There are even muddy sections and a water crossing deep enough that we have to wade. We have one last opportunity for a dip in a cool stream, and we are slowly on our way back to civilization. Once we hit pavement, we start to see tourists again, but this is a sparsely populated park with opportunities for solitude. We easily find grassy tent spots in the main park campground and are happy for warm showers. The next morning we rest and split up to explore different parts of the park. All three of us, however, are ecstatic to discover the homemade pies in the Gifford Homestead, part of the surprisingly lush Fruita Rural Historical District. I gobble down a piece of perfectly sweet and tart strawberry rhubarb and head back to camp for relaxation under the shade trees. That night I awake to the sound of a crying child and go for a small walk around camp to view the incredible night sky. Almost immediately, I see a bright white shooting star come out from behind the cliffs that tower over the campsite, moving away from the moonlight emanating from behind the rock. A few minutes later a full moon emerges from the middle of the cliff rather than from the horizon. I could not have planned a more perfect ending to this 10 day trip. Start and End – Torrey , UT. Torrey has hotels, restaurants, and a store to resupply. Time of year – Spring or Fall. We rode in May. Route statistics – 225 miles, 17,000 feet climbing, 1 National Park, 1 National Monument, 1 National Forest, and many trailheads and slot canyons to choose from for hikes. Water – Torrey, Boulder, and Escalante are the only towns. Deer Creek, Calf Creek, and Fruita Campgrounds have potable water. Stream water for filtering is available in Pleasant Creek, Blue Spruce Campground, and in various slot canyons. We had no trouble finding water. Bikes – We rode rigid and front suspension mountain bikes. Front suspension is recommended but not required. Tires – Mountain tires recommended but cyclocross tires would work fine too. I used Specialized Crossroads Armadillo tires, and they were great for the combination of paved and dirt riding.